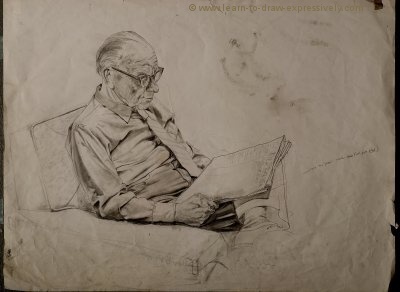 This is a drawing from life, of my father. He posed for me in 1991. 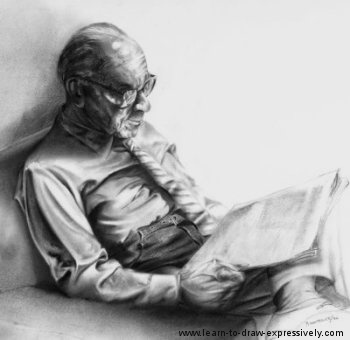 Unfortunately he died the following year, so this charcoal portrait is very precious to me. 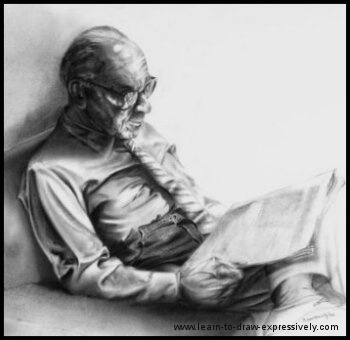 At the time, he was living in a senior’s high-rise, and I’d go over after supper and draw him while he was reading the local newspaper. It was a great way for us to visit, and it provided me with what I considered to be an important model. 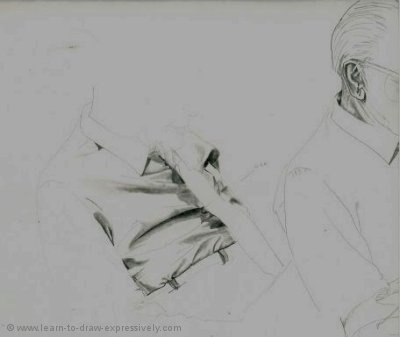 Initially he seemed a little nervous (as every model is when you are drawing from life) but he grew comfortable knowing I was drawing him. Side Note: I still get a little nervous when I draw people from life. If you are the same, you can first build your confidence by drawing your self-portrait in the mirror. 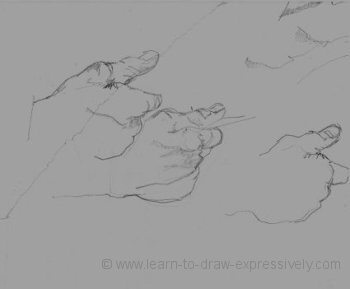 Once you are more confident, you can give more attention to your drawing and your subject. Now back to the drawing of my Dad. If you look carefully you’ll see a slight smirk on his lips. I think that smirk was there because he felt a bit self-conscious, but he was also enjoying the process. We did a series of sittings, but I never let my Dad look at anything until I had completed the portrait. Then when I showed it to him, he just stood there laughing with admiration...he couldn’t quite get over the fact that I had so accurately captured him on paper. The following two videos explain how I arrived at this drawing. 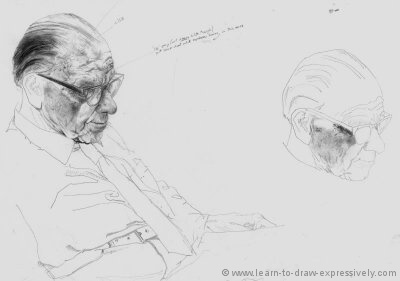 I’ve included my preliminary drawings and studies below so you’ll get an idea how I approach my portraiture. All of this preliminary work is done in pencil. The final piece is done in charcoal. Here I’m just beginning to establish the drawing. As in all of my drawings, I started with the face. To me it is the most important part, and until I get it right I don’t continue. The same is true of the body. Carefully placed contour lines already start to suggest the three-dimensional bulk of the body. Notice I’m starting to study his hands as well. Once I got the head to my satisfaction, (as in the preliminary example), I then traced my drawing using my light table. I then started to add detailed areas. You’ll notice writing which you probably won’t be able to read. Throughout the process I was making notes to myself which I would refer to for the final portrait. Notice I’m starting to address the folds in his shirt and the perspective of his foot. Here I’m starting to concentrate on skin textures. I've actually got my father looking older here than he actually looked, but I was purposefully emphasizing lights and darks for consideration when working on the final portrait. Note the detail - wrinkles, liver spots and veins on his forehead. All of these hands are studies in contour drawing. When properly done, lines alone can imply the bulk of the hand. 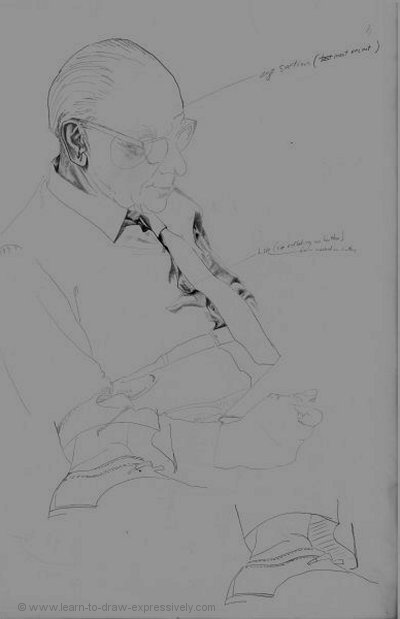 In the top right corner of this preliminary drawing, I am concentrating on the ear and the neck. Note the careful consideration being paid to the folds in the shirt. This is a detailed preliminary study of the shirt, the belt and the hand. Note particularly how those folds in the shirt imply the bulk of the body underneath. 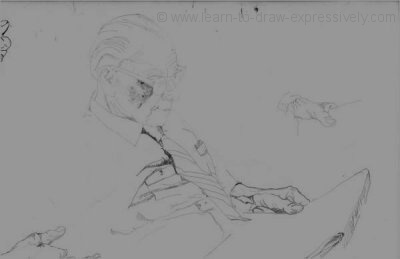 This kind of attention to detail adds a great deal to the final drawing from life. All of the lines I have used can be considered to be contour lines. Each contour line is accompanied with the appropriate shading . Contour lines are simply lines which are based on close observation. 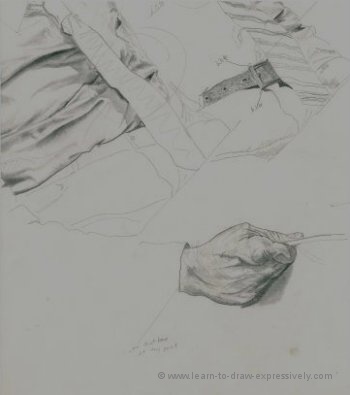 I have paid the same kind of attention to this hand study. Contour lines imply wrinkles and veins and an overall three-dimensional quality. The attention paid to the belt and the belt buckle clearly implies the texture of a leather belt. Note how the correctly placed shadows and contour lines make it look like the tie laying naturally across the shirt. This is the final preliminary pencil drawing from life, after which I did my final charcoal piece.